One Vodka factory owner traveled a lot across Russia. 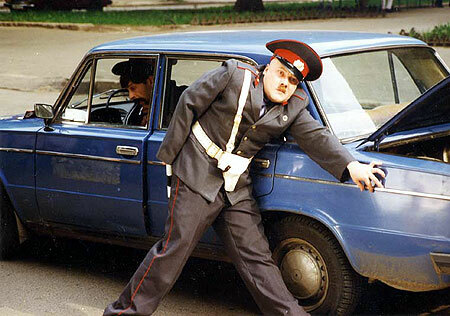 Wherever he was going he met a lot of Russian Road Police “GAI”, or “GIBDD”. He paid thousands roubles of penalties, all right on the site, as a direct to the policemen who stopped him. That a brilliant idea has come to him. He decided to start making a “Road Police Vodka”. 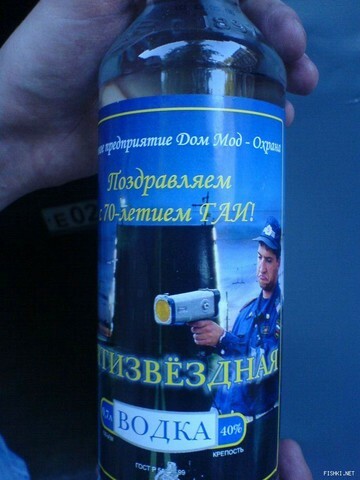 The vodka that would help insulted Russian drivers to relax after their driving experience. He didn’t want to delay the production of this new brilliant product so he just got off to the nearest highway and went as fast as he could. Finally he got stopped by a road patrol – yes he was ready to pay the bribe right on place. All he wanted is to make a photo that he would use on his new Vodka Bottle. Then he came back to his office, called a secretary, gave her a memory card with a photo and ordered: “We are now making a break-through market solution – Russian Road Police Vodka”. And the production started, and people started buying. First photo is from comedy show. The first photo is from famous in xUSSR TV-Show “Masks-Show”. yeah, true about first photo- i remember MASKI SHOW!! Is the actor outside the car meant to have that moustache to mock the Police as Little Hitlers? In the UK some people whistle Colonel Bogey (Hitler has only got one ball) when they pass a Traffic Warden (hands out parking tickets). made_in_ussr: I think we can manage it on our own, although it will take some time. Meanwhile, relax and try to make something useful with your own life. I know policeman in the first image – it stands with the radar on the departure from Saint Petersburg along The mosskovskomu highway:))) Money not pick, only pure alcohol. made_in_ussr: The only thing that I can suggest to you is: (1) adapt to the life as it is right now, most people have done it and feel fine; (2) move to live in Europe or USA, where you think you won’t have these problems – but I can assure you, you’ll have all sorts of other problems (I work in Western Europe and see it every day). So the moral is – wherever you live, you have all kinds of problems, simply because that’s what LIFE is! 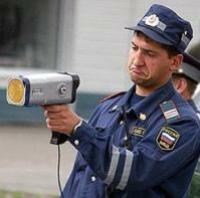 By the way, the police in Russia don’t charge you money for nothing – if you made mistake, then you have to pay. I never had any problems with them, because I try to drive carefully. But given the amount of drunk drivers and accidents in the country, it’s no wonder everyone complains about the police. Common guis!There ara lot’s of pictures from Russian comedy show, which is name “The Mask show”, for example tipsy policmen near by a car..You can’t beliv it! !